Tank containers were invented in response to the need of moving the bulk liquids. Two elements were considered very important in constructions of the tank: to make the tank container both lighter and have a bigger capacity, in order to become lighter and more space efficient means of transporting liquids. Tanks are available in many types and shapes: vertical and horizontal cylindrical, open top and closed top, flat bottom, cone bottom, slope bottom and dish bottom. Large tanks are usually vertical and have rounded corners. 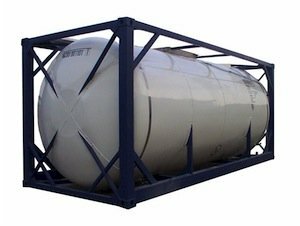 Most container tanks are designed to handle varying degrees of pressure. Steel remains one of the most used material for tanks, but polyethylene, fiberglass and thermoplastic are increasing in popularity. They offer lower costs and better chemical resistance. In tank constructions there are some relevant standards that must be respected: wall thickness, quality control procedures, testing procedures, accreditation, design criteria. Tanks are used for liquid cargoes, such as foodstuff (fruit juices, oils etc.) and chemicals (corrosion agents, fuels, toxic substances etc.). Tanks intended for transporting foodstuffs must be labeled "Potable Liquids only". Hazardous materials must be transported in tank containers with no openings below the surface of the liquid. If the temperature control is needed, the tank containers must be equipped in addition with insulation, heating or cooling system. The temperature must be very well controlled using temperature sensors. The heaters heat and cool the tank’s cargo by circulating brine or synthetic oil around external cooling coils on the tank. Generally, the heat transfer medium is glycol and the synthetic oil is used for higher temperatures. Tank containers allow quick delivery through both marine and overland transportation. They ensure an efficient distribution of the liquid cargoes. This container meets the requirements for both a storage container and a transportation container for dangerous cargo, which contributes at simplifying the procedures for moving the dangerous cargo. This container has special equipment for charging or discharging of dangerous cargo and keeps cargo quality in perfect condition during transportation. They are resistant to repetitive use, have big unit capacity, and require no extra-packing materials and this make them very economic. The type of container chassis was specifically designed with a lower deck - usually 40ft, in order to hold these special containers. Tanks experienced a great risk of accidents because of their liquid contents. The drop frame of the tank chassis has a lower center of gravity to offset this phenomenon. The container chassis provides a secure mechanism and eliminates the necessity of chains or straps. This chassis is the only safe and legal way to transport all the bulk liquids. A big variety of additional options such as tank linings or electric heating and cooling systems can be installed on tanks at the time of production or on existing equipment. The 20 foot shipping container is not only a basic unit of shipping measure, but also an integral building block for container homes. Find out more here! Interested in buying or building a shipping container house? 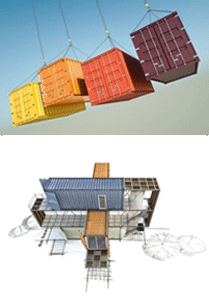 Learn about container housing companies and how they can simplify and streamline the process. Shipping Container Books and related materials. Copyright © 2015. Shipping-Container-Housing.com. All rights reserved.